Yet the slide remains one of the least studied domains of performance enhancement in bowling. Specifically, although we now have many slide heel and sole options, slide match up and relative slide distances are manipulated randomly and by feel rather than by a more scientific approach on the player’s end. “Gradual braking is the key to precision shot making and blending the slide allows the brain to complete the effort without having to protect the body from injury. When the weight of the ball in the downswing becomes disproportionate to the support mechanism, the brain will issue a command for the body to bail out of the shot. This is why players perform poorly on extremely slippery or tacky approaches. From my perspective, it is vital to understand the relative slide distances between slide/heel combinations in order to match up quickly and accurately while not wasting practice or competition time. Considering the fact that the amount of slide can impact timing as well as the energy transfer from bowler to bowling ball, from a professional standpoint, we must explore this area in more detail. To begin, it is essential to review what top players are doing. Specifically, how much slide do elite world-class players utilize? Which slide and heel combinations do some professional players use? In an effort to determine exact slide distances of many top PBA players, I utilized BowlersMAP “Calculate Distances from Lines” tool to estimate 11 PBA players’ slides. 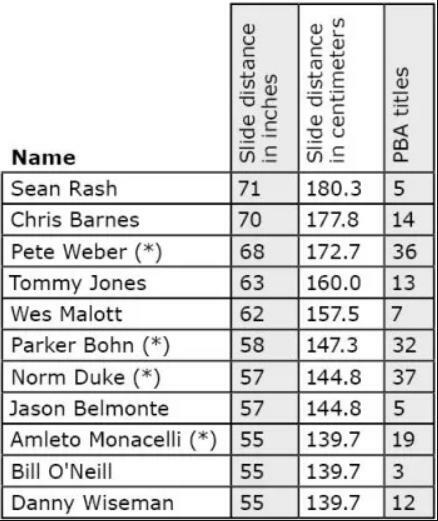 In addition to slide distance, it is interesting to know the slide and heel combinations of top players. According to Dexter, these professionals use the following combinations as their base slide combinations. In this analysis, you can see that all of these bowlers slide at least four and a half feet with a few sliding nearly six feet. This is not surprising when one reflects on energy transfer from the bowler to the bowling ball. Longer slides ensure a more efficient energy transfer as long as the ball arrives near the ankle when the slide foot stops. When I teach the physical game from an energy transfer perspective, I want bowlers to realize that the slide should begin as the ball is falling in the downswing. From a timing analysis perspective, I am looking for the ball to begin falling as the slide foot intersects the ball-side heel. As a bowler arrives into the slide, maximum potential energy is achieved from foot speed, forward trunk angle, and knee flexion into the slide which, as a system, helps to realize maximum push into the slide. In the downswing, as an elite player’s torso rotates from open to closed during the downswing, elastic energy is added into the potential energy system. In addition, in the downswing, the slide foot moves in front of the knee during the slide, allowing a spring like action when the slide foot stops. This requires a long slide to allow the slide foot to move in front of the knee. Objectively, the slide should stop as the ball reaches approximately the ankle of the slide foot. In this situation, the full amount of energy can be transferred to the bowling ball with a long and low extended follow through. Without an adequate slide distance, slide timing can be disrupted by sliding too long or too short on a specific approach material. If the slide continues while the bowler is throwing the ball due to not braking enough, both balance and leverage will be impacted negatively. This excessive slide will lead to imbalance at the foul line. To illustrate, the bowler, after throwing the bowling ball, will fall off the shot because the slide knee will not move forward or the slide foot will move in a lateral direction excessively as the ball is thrown. Conversely, if the braking is premature with early stopping of the slide foot, the player will pull down to complete the downswing and also fall off the shot as a protective measure since a heavy object is still falling after the person has stopped sliding. In both cases, this not only impacts balance and leverage, the bowler will not be able to observe ball motion accurately since they have not posted the shot. World-class long jumpers begin their warm up by determining their starting position relative to the runway board. These jumpers use a pre-determined distance based on their normal run-up which has been tested many times before competition. This normal run-up distance is unique to them based on their gait and leg length. They actually come to the track with a measuring tape to measure their start position accurately. These individuals will adjust according to the wind or the runway material. This is a precision approach. 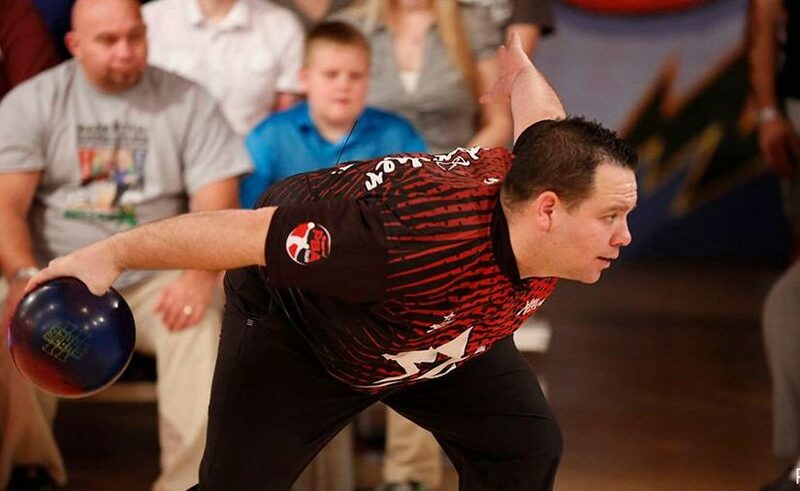 For bowling, there is very little substantive effort to comprehend a precise slide distance that equates to the individual’s timing and leads to maximum energy transfer. To be frank, there is too much guessing with most bowlers being random about slide. These players simply approach slide by feel rather than information that presents itself. Specifically, if the start position is uniform, they will slide a certain distance relative to the foul line. If a player is serious about being at their best, there should be an understanding of how far this individual’s slide should be based on their individual game. Specifically, the goal should be for the slide to stop as the ball reaches the ankle. For each bowler, there is an ideal slide distance which will achieve this to maximize the highest level of efficient energy transfer to the bowling ball. Each player should know exactly how long this distance is. 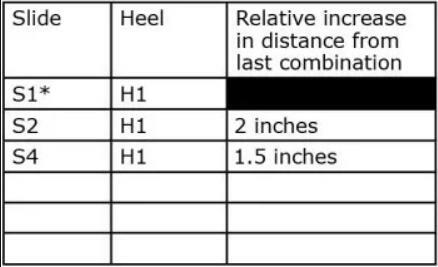 Such knowledge would allow them to make more proactive sole and heel changes since they know the relative differences between all combinations. To help structure your exploration of relative slide distances, it is important to have a sense of the amount of friction differences between slide soles. The coefficient of friction is (µ) = f / N where N (newtons) is the normal force (mass X gravity) and f is the amount of force resisting movement. Slide soles work by altering the amount of friction between the sole and the approach. In short, it is the amount of resistance to movement when the sole makes contact with the lane material. A lower coefficient of friction will reduce the braking effect while a higher coefficient of friction will increase the braking effect. After 100 games, the COF of the sole will change due to dirt build up in the fibers of the sole. This will change the ball position when the foot comes to a stop during the slide. Another 100 games will alter the COF number again causing the leverage to weaken even more as the ball is now out in front of the ankle when the foot comes to a stop. No one knows exactly how many games it takes to stabilize a slide sole due to the various materials that the manufacturers use. In my opinion, once the sole turns dark due to dirt build up, the sole has reached its max COF potential. The same applies for heels as long as the rubber compound maintains its integrity. Once you lose your leverage due to oversliding, it’s time to change the slide sole. Through testing and with the aid of a certified coach, determine your ideal slide distance (ISD). This is the slide distance that equates to your timing getting closest to what I feel is pure ideal timing (when the ball is closest to the ankle when the slide foot stops). Know the exact slide distance difference between all of your combinations and place it in a reference table. With such knowledge and awareness of where you are currently sliding relative to the foul line, in a competition or practice you could make a logical change and more quickly match up to the new environment. As soon as you arrive in a new bowling center, you should test the approaches to gain an understanding of the texture and amount of friction on that approach material. Depending upon the season of the year and your location, the approaches can be very tacky or slippery. If you bowl at least three times per week, change your most used slide soles every four months or every 200 games. Previous Previous post: Bowling tips: How to find the right posture for your bowling game?